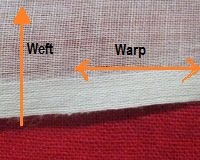 There are many reasons to know warp direction of the fabric before you go for using it. To make it easy for determining warp and weft in a fabric piece observe the following characteristics of the fabric yarns. Yarn appearance: Warp yarns are comparably finer than weft yarns and comparably higher twisted yarn. Stripe/check patterns: If fabric got colored stripes then stripe direction shows warp (mostly). In checks, if you find one color with odd numbers of threads, it is warp. Then it is easy to determine warps as parallel yarns with selvage is warp. And yarns those are perpendicular to the selvage are weft or filling yarn. Comparably difficult to pull out warps from fabric. 1. Reed mark – you will find gaping after each pair of yarns. Online Clothing Study: How to Determine Warp and Weft in a Woven Fabric? Learn how to identify the warp and weft yarns in a fabric. A detailed guide for comparing wart and weft.